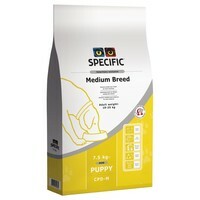 Specific Everyday Puppy Medium Breed CPD-M Dry Food for Puppies is a well balanced nutritional diet for medium breed puppies with an adult weight between 10 to 25kg, from weaning until they reach 80 of their adult weight. Containing increased levels of proteins, energy, vitamins and minerals to support the nutritional requirements of growing puppies, Specific Puppy diets also include a high content of Omega-3 fatty acids which support your puppy’s brain and vision development. They will also help develop strong joints and a healthy coat and skin. Specific Puppy Medium Breed also contains added Beta Glucans to support your puppy’s immune system, and adjusted levels of calcium and phosphorus for healthy teeth and bone growth. 5 Great delivery service and custom service. Great value for money.